We are fast approaching the 95th anniversary of America's entry into World War I (April 6, 1917) which led to the creation of the Library War Service of the American Library Association (ALA) a few months later. 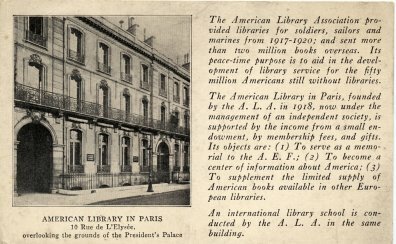 One of the legacies of the Library War Service was the creation of the American Library in Paris (ALP). I recently added a couple of items to my librariana collection related to the ALP. The first is a postcard showing the home of the ALP at 10 Rue de L'Elysee. The postcard was obviously produced by ALA and includes information on ALA's role in WWI as well as information about the ALP. It notes that the objectives of the ALP are: "1) To serve as a memorial to the A. E. F. [American Expeditionary Force]; 2) To become a center of information about America; 3)To supplement the limited supply of American books available in other European libraries." The postcard also indicates that an international library school is conducted by ALA in the same building as the ALP. The postcard which is unused was probably published in the early 1920s. The second item I have added is a 1936 newspaper (Chicago Tribune) photograph which documents the preparations for a move of the ALP to a new location at 9 rue de Teheran in Paris. It depicts ALP Librarian Dorothy Reeder, President of the ALP Joseph Du Vivier (seated), and First Vice-President Countess Clara Longworth (standing in the doorway). Both Reeder and Longworth played important, if not heroic, roles in the ALP's continued operation during World War II while Paris was occupied by Germany. There is a good history of the ALP on its website. 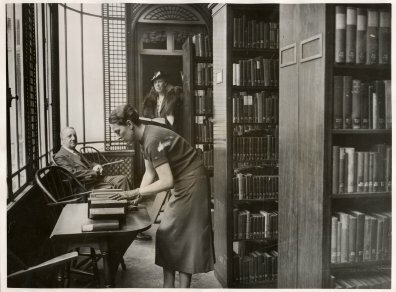 Mary Niles Maack has written an excellent article about the American Library in Paris during the period 1939-1945 which contains more information about Reeder's service at the library. I have previous posts about the ALP HERE and HERE. just curious: do you get the library newsletter? in the last issue (u can see it online) there are many great pics! the library is also on twitter! i have to admit, i've never seen this postcard! how did you get it? on ebay? interesting! thank you! you could email the library and request a copy of the newsletter! just let me know and i "warn" them (i work there but from home)we also have a digital newsletter you could subscribe to!